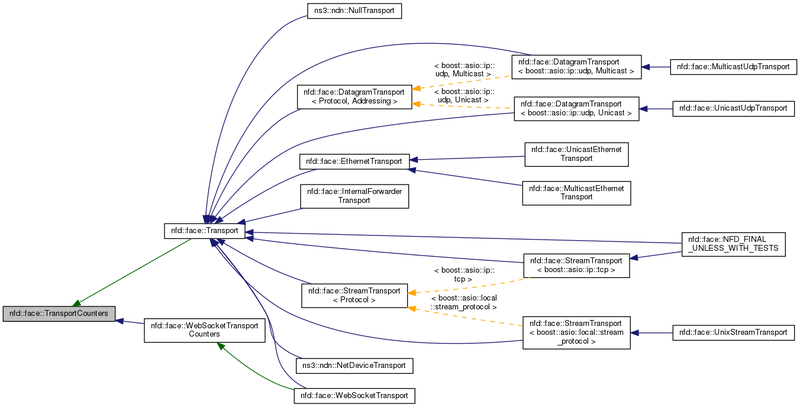 The type name 'TransportCounters' is implementation detail. Use 'Transport::Counters' in public API. Definition at line 58 of file transport.hpp. A 'packet' typically means a top-level TLV block. For a datagram-based transport, an incoming packet that cannot be parsed as TLV would not be counted. Definition at line 67 of file transport.hpp. A 'packet' typically means a top-level TLV block. This counter is incremented only if transport is UP. Definition at line 74 of file transport.hpp. This counter includes headers imposed by NFD (such as NDNLP), but excludes overhead of underlying protocol (such as IP header). For a datagram-based transport, an incoming packet that cannot be parsed as TLV would not be counted. Definition at line 83 of file transport.hpp. 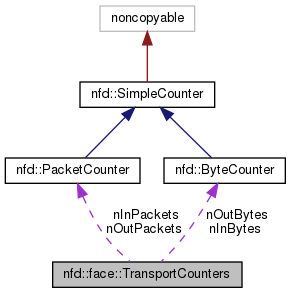 This counter includes headers imposed by NFD (such as NDNLP), but excludes overhead of underlying protocol (such as IP header). This counter is increased only if transport is UP. Definition at line 91 of file transport.hpp.